What’s that saying—Do what you love, and you’ll never work a day in your life? That phrase comes to mind when talking to Larry Polster, an active trawler cruiser and vice president at Kadey-Krogen Yachts. For many who work in the marine industry, work-life balance lines can get a little blurred. And so it seems talking to Larry about the new boat he and his wife Janet took delivery of last December. He’s so excited to share details about his new Kadey-Krogen 50 Open and all the cruising opportunities it will afford that it’s difficult to tell where the enthusiastic cruiser ends and the Kadey-Krogen executive begins. But that’s okay. In fact, it’s how Larry landed his job at Kadey-Krogen Yachts. Larry grew up boating with his family on the Great Lakes. After college graduation, a job with a consulting firm brought him to the Washington, DC, area, and then took him to Florida where for a period of time he lived aboard a sailboat. When business called him back to the DC area 27 years ago, he moved to Annapolis. “I sailed into the Chesapeake Bay, and I’ve been here ever since,” he declares. Larry and his wife, Janet, continued to sail for a time and in the late 1990s even spent a year cruising with their then toddler-aged daughter. When the family made the decision to move to a powerboat in 1999, they purchased their first Kadey-Krogen, a 42-footer… and the die was cast. Larry’s love for the boat eventually inspired him to join the Kadey-Krogen team. 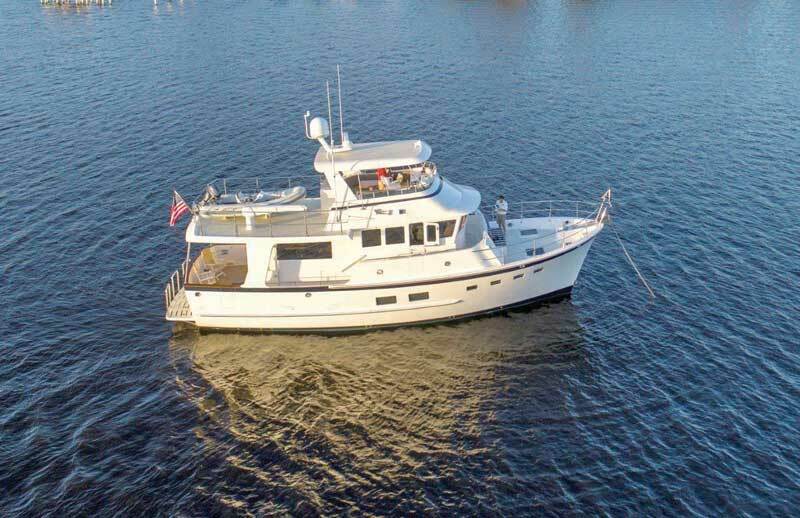 Although the couple also owned a Pearson True North 33 for a time (a very nice Bay boat according to Larry), they were ready to move back to a full displacement cruiser when their daughter went to college. But we’re getting ahead of ourselves. Larry was so pleased with his 42-footer that while still working as an IT consultant, he volunteered to help Kadey-Krogen Yachts at the 2002 Annapolis Powerboat Show. His knowledge and enthusiasm must have won them over, because at the end of the show he was offered a job at the company’s home office in Florida—a job that he politely declined. However, the wheels were now spinning, and by the next year, 2003, Larry had opened the Annapolis Kadey-Krogen office. A few years later, he became a partner in the business. 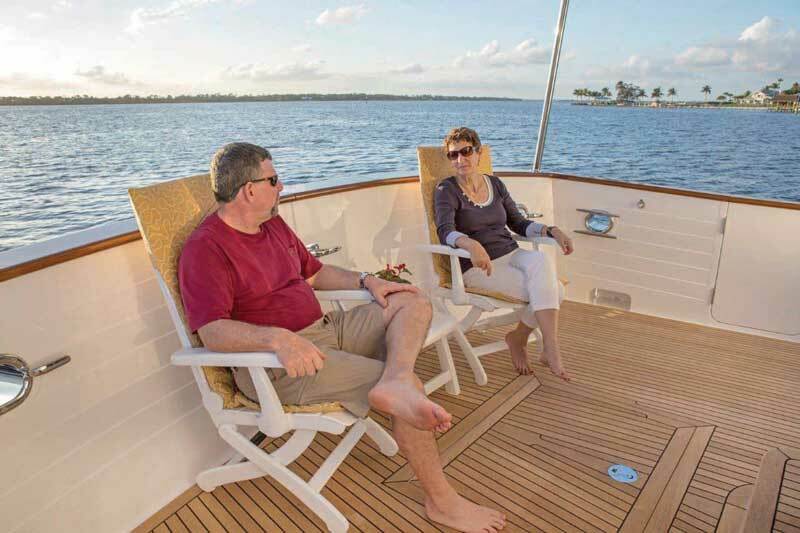 Over the years Janet and Larry met many owners, listened to their cruising stories, and glimpsed their lifestyle. When Janet retired in 2015, she dreamed of going to the Bahamas. Larry was all in, and the two embarked on the adventure of building their newest boat, Together, hull number one of the new Kadey-Krogen 50 Open Series. The building process took two years, and Larry and Janet were intimately involved in it all along the way. The couple took delivery in Florida in December 2017. 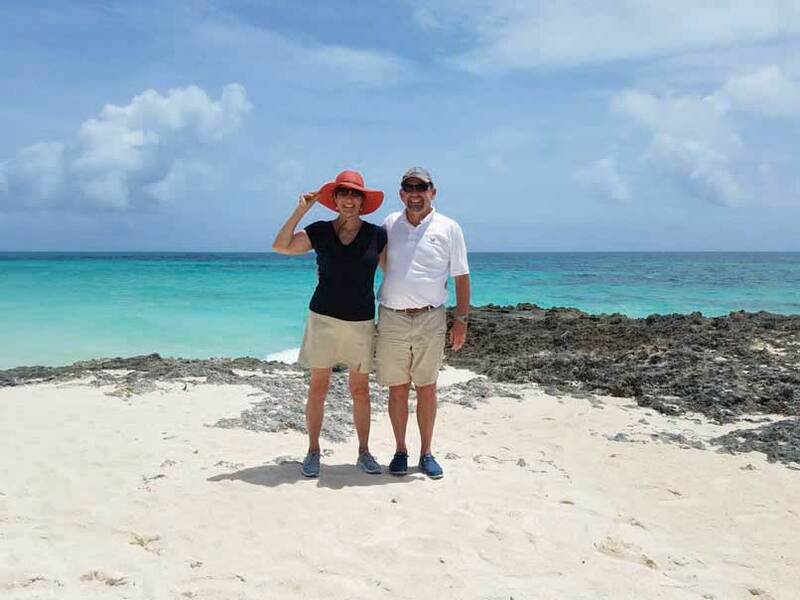 The couple dreamed of cruising to the Bahamas, and if May of 2018 they did just that. Larry agrees, saying “During that trip and afterward bringing the boat to Annapolis, I learned that I can run my business from the boat.” Which means there’s not much holding them back. In fact, as you read this, the couple plans to be on an extended cruise on the waters off New England. They will be back in the Bay this fall, return to Florida in the winter, and head to the Bahamas again in April. Dozens of Kadey-Krogen boats live around the Bay, and in the summer, transient cruisers exploring the area increase that number substantially. The annual rendezvous in Solomons, MD, usually draws 30 or 40 boats. Krogen’s Cruisers, the independent owners’ group, connects owners by region with other cruisers to share social events, maintenance tips, and more.